The Royals are 1-0: lots to get excited about from Opening Day. Aside from the clouds, a few moments of spitting rain and a 10 minute panic attack after Yordano Ventura grabbed his right wrist, Opening Day went swimmingly. The Royals won 10-1 and Ventura was the dominant pitcher we need him to be. The bats were hot as Jeff Samardzija was introduced to the Royals high contact bats. Every Royals hitter reached base but Omar Infante, and even he hit the ball hard on Monday and deserved a better line than he ended up with. Mike Moustakas and Alex Rios homered. Morales drew three walks. Ryan Madson threw his first inning of professional baseball in 4 years in the 9th. It was a fun game. But it’s just one game, and we can’t thump our chest too much. Just like last year’s Opening Day loss to the Tigers, we can’t jump to conclusions about this team based on one game. It’s a 162 game season, and this one game – despite it being a stellar performance – only counts for 1, and the Royals magic number is 162. So, there’s still a lot of work to do. That said, we can pull a few nuggets of speculation out and celebrate the signs of what may (or may not) be to come. Let’s get to it. Moose’s first career opposite field home run. Yes, you’re reading that correctly. Monday’s home run off Samardzija was Moose’s first ever to the opposite field. Here’s his HR chart via ESPN Stats & Information. Three things stand out here. The first thing that stands out is that one lone red dot in right field that is way further than all the others. That one came off of Lance Lynn on June 24, 2012. Recorded at 464 feet. The second thing that stands out is the home run the farthest left, which is the one Moose hit on Monday. It’s obviously a rare scenario for Moose to hit anything to the left side, so to see him hit for power the opposite way is something to celebrate. 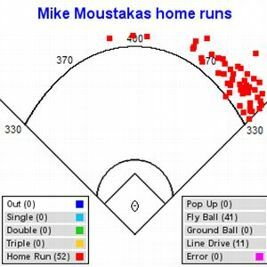 I think if Moose can get it into his head that he can have success without pulling the ball, we could be in for a decent season from Mike Moustakas. Which would also be rare. But then the third thing that stands out is that the home run wasn’t to left field at all. “Opposite field” is technically based on splitting the field right down the middle. As you can see, Moose’s homer barely qualifies. If you asked what part of the field that HR went to, you’d say it went to center field, not left. So technically, it was opposite field, but it wasn’t THAT opposite field. So let’s keep our emotions in check here because it wasn’t like he sliced one into the bullpen in right. So lets not get carried away and start talking like Moose now hits with power to all fields. The newcomers do not disappoint. Did any Royals hitter walk three times in a game last year? I could probably look it up, but it’s easier to speculate that it never happened in 2014. Somebody prove me wrong. We’re one game into the 2015 season and it’s already happened. Kendrys Morales walked three times on Monday. One of them was intentional. Last year the Royals finished dead last in all of baseball with 380 walks. Their team OBP still managed to end up middle of the pack aided by their high batting averages, but if we can work the count and get on base more, this team is going to be extremely dangerous on offense. With three yesterday, Morales is currently on pace for 486 walks. Obviously he’s not going to do that, but it’s fun to say. He also doubled. I still like this signing. Alex Rios was even more impressive. He went 3-4 with a home run and a stolen base. In the 7th inning with the Royals already up 6-1, Rios got the pitch he was looking for on a 3-1 count and deposited it in the right field camera booth. Along with walks, the Royals also lacked power last year finishing dead last in MLB with only 95 big flies. People weren’t happy with the Royals gave Rios is $11M deal for the 2014 season, but if this is a testament of what’s to come, then we’re in for a treat this year. And Ryan Madson, the last player to make the Royals 25-man roster, pitched the 9th inning. He gave up a hit and a walk, but induced a double play and ended the final frame with no damage. Madson hasn’t pitched since 2011 with the Phillies but has already managed to comeback and make a MLB roster after being out of the game so long. He has upside as a veteran in the bullpen, and it’s good to get him some work in a stress-free situation like Monday was. Ventura looked like an ace on Monday, yes? His stuff was working, he looked comfortable. He only gave up 1 run – an absolute monster home run to suspected robot, Jose Abreu – and he was only at 78 pitches when he left the game with a thumb cramp. When I saw Yordano slumped on the grass holding is arm and writhing in pain, I panicked. I thought that was it and that the season was already over after just 6 innings of baseball. Kauffman Stadium was silent and suddenly the cheering subsided. Herrera came on to pitch the rest of the 7th. It looked serious in the moment, but quickly it was speculated and confirmed on twitter that it was just a thumb cramp. But it highlights this truth: if the Royals are going to succeed in 2015, their two young starters, Ventura and Danny Duffy, are going to have to stay healthy and carry this team. Both have a history of scaring us. Duffy had Tommy John surgery two offseasons ago and was the Royals best starter last year coming back from surgery, and Yordano had multiple moments in 2014 where he left the game early or missed a start with fears about his arm/elbow. We need these guys to throw a combined 380-400 innings. This is becoming a theme, I suppose, but the AL championship ring ceremony and postseason video montage got the water works flowing again. I couldn’t help it. I’ll probably always cry when I think about that 2014 run. The Wild Card game. All three ALDS games. The ALCS clincher. Game 6 of the World Series. They all brought tears of joy to my eyes. I’m not even embarrassed about it anymore. There weren’t any clips from Game 7 in the montage. I expected it to end with some “unfinished business” tag at the end, but it didn’t. It just buried the sadness and highlighted the celebrations. Fair enough. Bruce Chen was back and got a ring. He may have received the loudest cheers. Billy Butler, James Shields and Nori Aoki were not in attendance because they were playing baseball elsewhere. Louis Coleman, recently placed on waivers, got a ring too and it was awkward. Aaron Brooks got a ring for his single miserable performance. Ned Yost told the team physician not to lose his ring doing rectal exams. I’m supposedly heading back out to the K tonight. We’ll see if the game happens or not with the rain we’re supposed to get. Danny Duffy gets the ball either tonight or for the first part of a double header tomorrow. Good to have the Roys back in town and off to a good start. I’m still convinced that this team is better than last year’s team. I expect the playoffs…then who knows. Next Next post: The Royals are 7-0: AL HBP Conspiracy, Rios’s injury, and the problem of that other good team in our division.